Vancouver architect Michael Green is proposing to alter the iconic Parisian skyline — by building the world's tallest wooden building. 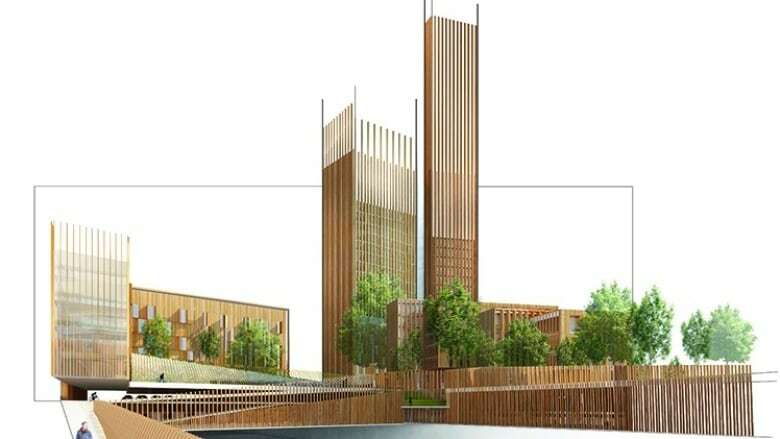 "Just as Gustave Eiffel shattered our conception of what was possible a century and a half ago, this project can push the envelope of wood innovation with France in the forefront," said Green in a press release. An entry for Reinventer Paris — a competition launched by the City of Paris for innovative urban projects — the Baobab project is a collaboration between Michael Green Architects (MGA), Paris-based DVVD and real estate developers REI France. The Baobab would be constructed on the "Pershing Site" in the 17th arrondissement, next to the Palais des Congrès. It's designed to span the eight-lane teeming ring-road, the Peripherique, and is an attempt, MGA says, to not only introduce a lower level of carbon footprint to the city, but also create a sustainable, vibrant new housing alternative. A blend of market and social housing, a student hotel and urban agriculture, the Baobab project also includes a bus station, e-car hub and other amenities. "Our goal is that through innovation, youthful social contact and overall community building, we have created a design that becomes uniquely important to Paris," said Green. Green has long been a proponent of wooden skyscrapers, presenting his argument at the 2013 TED Talks.